The photo on the left was taken by NASA from the Hubble Telescope. 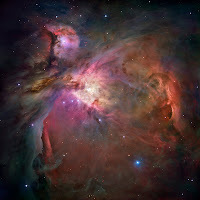 It shows the Orion Nebula. This Nebula happens to be one of the brightest in the night sky and is visible with the Naked Eye. Since Orion's Nebula or M42 is the closest nebula to us has shown us much about how stars and planets are formed from collapsing clouds of gas and dust. You can see this even with some light pollution. Just look south of Orion's Belt the the sword which is 3 stars. This is in the center of those 3. This is a great blog! Just popped over after you retweeted my Atlas of Place Names item, for which thanks! I'm glad you enjoy it! Thanks for visiting! It is so fantastic!!! I've the sensibility to understand the beauty of images of the Space. The Black Holes is too wonderful as a shine!! !